Dissimilar metals. Why does NZBC E2 get it wrong? We get a lot of questions from architects on dissimilar metals. 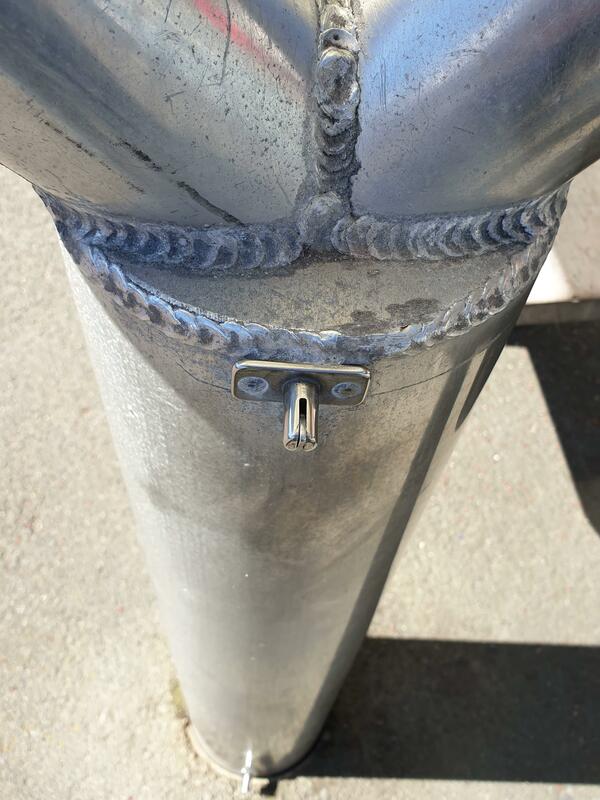 'Avoid contact in sea spray zone or corrosion zone D' for Stainless Steel and Aluminium... But it's ok for galvanised steel and aluminium to be used!! Why?? Have a look at the pictures below and ask yourself why?? These pictures are about 1.5m apart on the same aluminium structure at the Caledonian sports ground in Dunedin. Its quite close to the harbour and only sneaks into corrosion Zone C by about 250m. The answer lies deep in the mysterious process of galvanic corrosion. Now I'll come clean, I'm no expert in this area, there are others far more qualified than me to write on the subject (Feel free to correct me if I'm wrong anywhere :-). However, I'm going to write about it anyway because someone has to call out E2 if its wrong. Galvanic corrosion (aka bi-metallic corrosion, or dissimilar metals corrosion) according to Wikipedia, is 'an electrochemical process in which one metal corrodes preferentially when it is in electrical contact with another, in the presence of an electrolyte'. A well known and effective electrolyte (aka 'catalyst') is of course salt water, or even just salt on it's own with the help of moisture in the air. To tell which metal will eat the other, and how hungry it will be, you need to look at the Anodic index. I have pasted this below. Put very simply, in layman's terms, (remember I'm no expert) the low numbers will eat the high numbers, and the distance between the numbers tells you how hungry they will be. Hot dip zinc plate galvanised steel will be eaten by the aluminium at a slightly slower rate with a difference of 0.3 volts. Now we can see where the logic of the E2 table comes from, and when based on this logic it appears to be correct. Why then the evidence to the contrary?? Table 21 doesn't take into account the relative mass of the two metals in contact. The appetite of the 'eater' metal diminishes proportional to the difference in mass if the 'eaten' metal is larger, and conversely increases if the 'eaten metal has a smaller mass. The size of the area that is in contact also has an effect. So, if a small piece of stainless steel, like a bolt, is in contact with a large piece of aluminium, like an extruded louvre, not a lot happens. 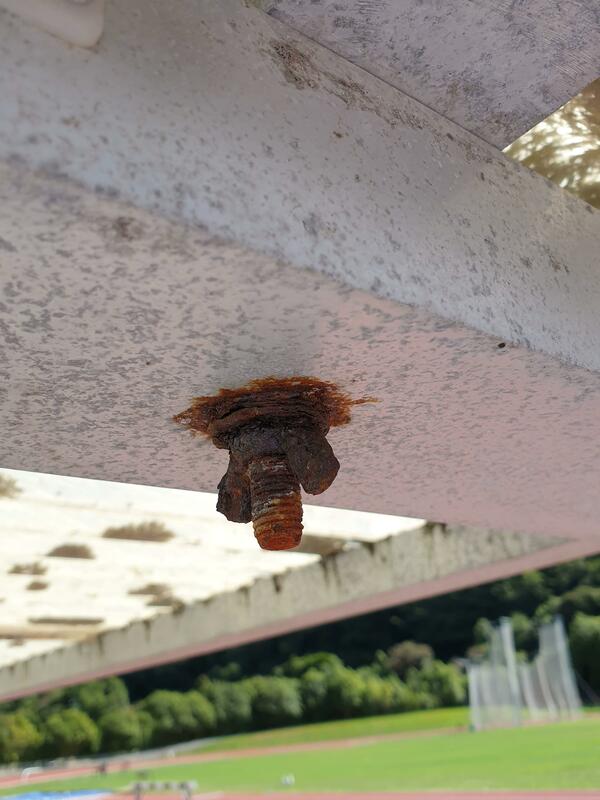 However, if a small piece of galvanised steel, like a bolt, is in contact with a large piece of aluminium you get problems. The protective Zinc coating on the steel is eaten in short order and the steel is exposed to the elements. Remember, this only happens if the material is in electrical contact (I'll leave water runoff for some other day). If your aluminium is powdercoated (right through the hole) you are unlikely to get an issue as it is normally a suitable level of isolation. You can of course just take the conservative (sometimes more of a lazy/ignorant) route and just always isolate the metals. However, 1) everyone in the industry should understand these things from first principles, and 2) the E2 document I have an issue with is in relation to dissimilar metals in contact so hence the blog post. I'm going to make some aluminium test specimens, different levels of surface finish on each specimen, and a range of fasteners in each one, then do a 1000 hr salt spray test on them as a little R&D project that will hopefully remove some of the confusion that is out there courtesy of E2.